Jim Thorpe is a small, historic town in eastern Pennsylvania. Often referred to as the ‘Gateway to the Poconos’ and the ‘Switzerland of America,’ this picturesque area attracts visitors who wish to get away from the hustle and bustle of city life. Jim Thorpe has a population of only 4,600, which means you won’t be fighting massive crowds while enjoying the town. Jim Thorpe can be easily accessed from Philadelphia and New York City and is located only 80-100 miles, respectively. Named after the Olympic gold medalist of the same name, Jim Thorpe has a relatively mild climate that typically ranges from a wintertime low of 16 degrees Fahrenheit to a July high of 84 degrees. Finding a nice assortment of food options for every dietary preference is easy! That’s because many Jim Thorpe restaurants include menu options that are gluten free, vegetarian and vegan friendly. Some of the local hot spots for dining that feature American food options include Moya, Stone Row Pub & Eatery, Molly Maguires Pub & Steakhouse, Alice’s Pantry and the Broadway Grille. Are you more interested in Italian food? Jim Thorpe has you covered with restaurants such as Encore, Trattoria 903 and Antonio’s Pizzeria. Wine lovers will find a nice selection at the Libations Lounge. Others who want a drink can head toward the Union Publick House, Penn’s Peak and Reiley’s Pub. When it’s time for dessert, you can get a steaming cup of hot chocolate at Muggles Mug. Alternatively, there are plentiful ice cream options, including Annie’s Ice Cream, Wood’s Ice Cream and Scoops Ice Cream Shop. Jim Thorpe, Pennsylvania, has several bars and a winery, but you need to leave the city to find an actual brewery. Fortunately, there are several breweries near Jim Thorpe that are worth checking out. If you’re on your way to Wilkes-Barre Township, be sure to make a stop at Breaker Brewing Company. Conyngham is home to the Conyngham Brewing Company, and Bethlehem features Bonn Place Brewing Company and the Hop Hill Brewing Company. Do you want to try several breweries in one town? Easton has you covered with the Weyerbacher Brewing Co, Two Rivers Brewing Company and Böser Geist Brewing. Unlike many other small towns, an overview of Jim Thorpe must showcase the robust list of activities that keep tourists and locals entertained. People with an interest in history will be especially enthralled by the Asa Packer Mansion, the Old Jail Museum and DeFeo’s Manor. Railroad and train enthusiasts often plan a trip to Jim Thorpe for the Lehigh Gorge Scenic Railway. Anyone who wants to see and photograph the area’s natural beauty should also consider adding this to their must-do list. There’s even an open-air car option that will let you take photos without being encumbered by windows. Other noteworthy things to do in Jim Thorpe include visiting the Jim Thorpe Memorial, learning about nature at the Bear Mountain Butterfly Sanctuary, hiking the Glen Onoko Falls Trail, attending a wine tasting at the Big Creek Vineyard and perusing the paintings at Victor Stabin Fine Arts and Prints. When it comes to lodging, Jim Thorpe hotels offer a wide array of choices to fit every lifestyle and budget. Those who want a truly luxurious vacation can rely on the historic four-star Harry Packer Mansion Inn. If you prefer something a little more low-key, there are numerous elegant three-star hotels to choose from such as The Inn at Jim Thorpe, Hampton Inn Lehighton-Jim Thorpe and the Suites on Broadway. Those who prefer an economical approach can choose from a long list of two-star hotels, including Country Inn & Suites by Radisson, Broadway House and the Mahoning Inn. Are you looking for a bed and breakfast or some other type of lodging? 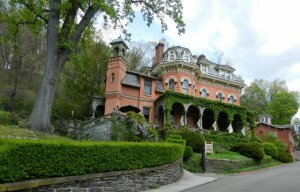 There are several other local area lodging options such as the Mountain View Suites, Parsonage, Hill Home Forge, Times House, Lantern Lodge, Hillcrest Bed & Breakfast, Hotel Switzerland, West Broadway at Jim Thorpe, Gilded Cupid B&B, Jim Thorpe Camping Resort, Rosemary Remembrances II and Angel of the Morning Bed and Breakfast. 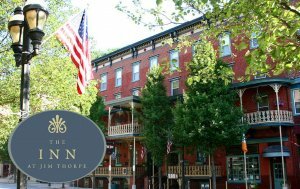 No matter where you choose to stay or what you choose to do, Jim Thorpe, Pennsylvania, is certain to provide a memorable trip. The best time to visit is mid-May through October. Travelers who love fall leaves will definitely want to plan a trip in the fall when they can see the gorgeous Lehigh Gorge filled with a dazzling array of colors.